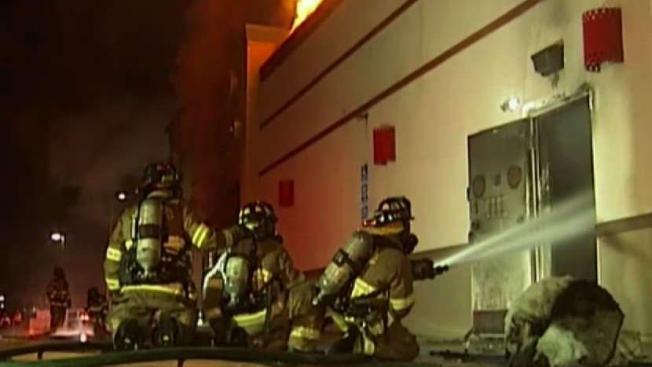 A Kentucky Fried Chicken restaurant in Antioch is considered a total loss after a two-alarm fire caused heavy damage early Wednesday morning, according to fire officials. Three Pittsburg residents have been arrested in connection with last week's suspicious early morning fire that destroyed a fast-food restaurant in Antioch, according to investigators with the Contra Costa County Fire Protection District. The two-alarm fire was initially reported around 12:45 a.m. Wednesday at a KFC restaurant on Mahogany Way, and flames were already coming through the roof when firefighters arrived at the restaurant. Crews determined that it was unsafe to enter the building due to the presence of air-conditioners on the roof, one of which had already fallen inside, so they fought the fire from outside. Fire officials said they considered the building a total loss, and the blaze was later alleged to have been a result of arson. Over the next two days Raveena Raman, Miuler Reyes and Octavio Montano Jr., all 18 years old, were arrested and booked into the county jail on suspicion of arson.